It seems all days start early these days. It was 76 at 5:30 when we walked. We really don’t like walking that early but it’s early or not at all these days. Today, after breakfast we finished up our packing and headed to Red Bay. It was an uneventful drive and we arrived a few minutes before 12:00. 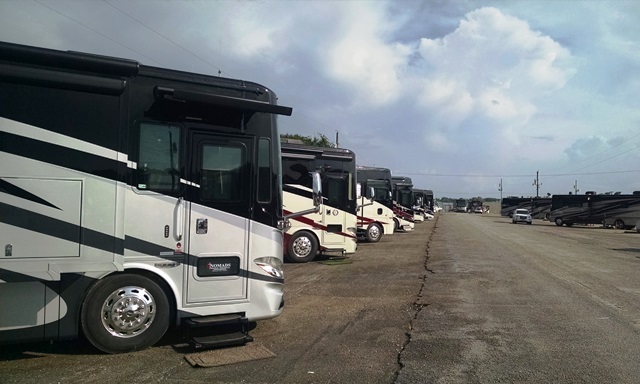 There were two rigs in line in front of us for check-in but there were plenty of empty sites. About 1/3 of the sites have rigs waiting for service but if this week is like others, a lot of rigs will come in tomorrow. Hopefully we will not be waiting too long to get our last warranty work completed. After getting parked and set up, we drove over to Belmont, MS, only about 6 miles away, to a Mexican restaurant that has been recommended several times. The restaurant is across Main Street from the famous Belmont Hotel (and the somewhat less famous Monkey Barber Shop). After our late lunch, we walked around the campground, but it was too hot for our neighbors to be out. We had another afternoon thunderstorm come through today, and the temperature dropped about 10 degrees. With the cooler temps, we were able to take another walk shortly before dark and met a number out our neighbors. Everyone is here to have a problem resolved by Tiffin but everyone is good-natured about it. It’s fun to meet people from all over the US and hear their stories. Of course it is also a chance for us to share information about NOMADS. It should be an interesting week and it’s really nice to be “back on the road”, or at least away from Tuscaloosa. We will be back to travel mode soon, we hope. Hope everyone is having a great weekend.